Used plastic pallets, by Pallets Sydney, are supplied and delivered direct from Sydney used pallet recycling firm who has a massive range of used plastic pallets. Our used plastic pallets are quality checked to make sure they can carry your products safely. 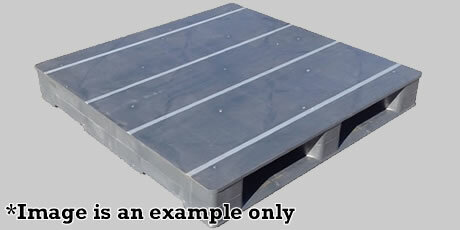 Our used standard plastic pallets are an affordable option and many can carry weights up to 2 ton. These used standard plastic pallets are perfect for transporting locally in Australia or utilising in static locations for storage purposes. Our used oversize plastic pallets, generally 1200 x 1200 or larger, are in stock and ready for rapid delivery. Oversize plastic pallets are ideal for large single items. Our options include nestable, which are an egg cup shape, or a block configuration. All our used export plastic pallets are quality checked before rapid delivery and come in a range of configurations that include two way or four way forklift access, nestable or non nestable, and a massive range of sizes. Used nestable plastic pallets are ideal for stacking inside each other which gives a low storage footprint. They are lightweight and give four way access to a forklift or pallet jack. These pallets can generally carry up to a 1 ton with ease. Have you considered a new timber pallet as an option? Find out what the many benefits are to using a new timber pallet within your operations. Have you considered a new plastic pallet as an option? Find out what the many benefits are to using a new plastic pallet within your operations. Need a quick used plastic pallet quote? Either call us direct on 0400 845 713 or, fill in your requirements on our quick quote form and we will get back to you as quickly as possible. We received terrific service from Pallets Sydney. The product we required had to carry 1 ton comfortably. To keep costs down we decided to use a used plastic pallet for one way transport. We are very happy with the product. Recommend! We would like to recommend Pallets Sydney for their service and used pallets. We have never had a problem and they are very professional. We have used them on many occasions.